Me: Have you thought about where you would like to eat lunch? Lu: No, but I'm hungry, so let's decide. Me: I will do a search. Some of these we had been to before...Cafe Dupont, Highlands Bar and Grill, and Fish Market. Some, we knew were not open for lunch...Hot and Hot Fish Club. So that left us with Primeaux Cheese and Vino, Tau Poco, Foodbar, Dixie Fish Co., Todd English P.U.B. and Vittoria Macelleria. 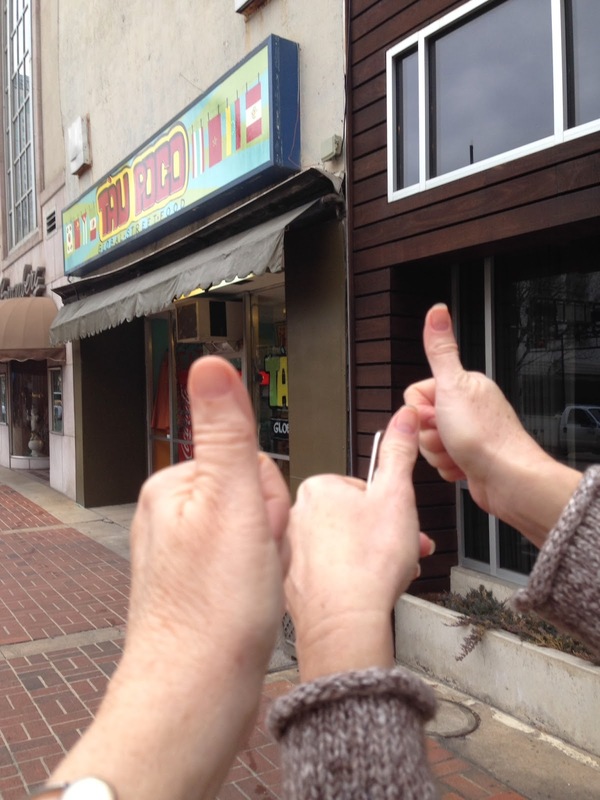 Of those, we had already passed the exit for Primeaux Cheese and Vino, so we eliminated that one. Good, we had our list whittled down to five. Of those five, Foodbar was only open at dinner and Vittoria Macelleria was closed for the day. We weren't really wanting seafood and the reviews for Todd English P.U.B. 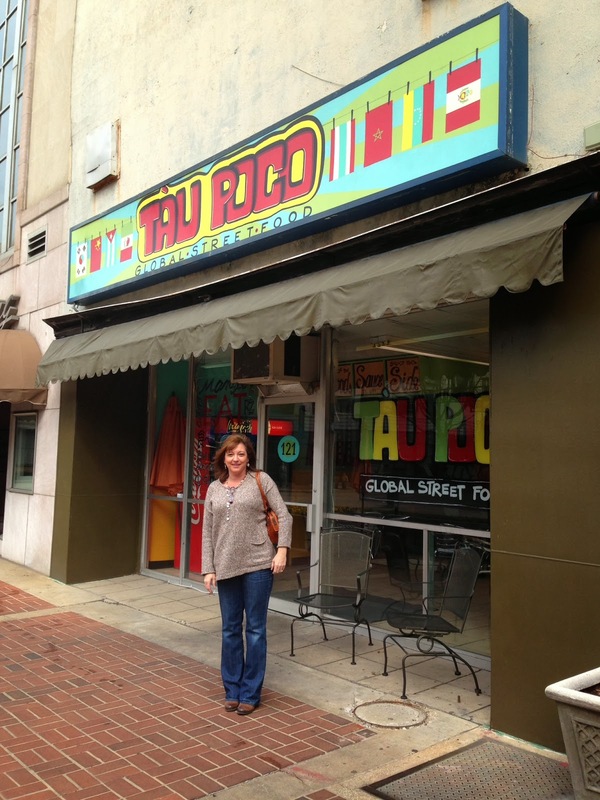 were not promising, so we settled on Tau Poco on 20th Street North. First, we liked the name. Second, we liked the concept, kind of a multi-ethnic global food truck without the truck. And, finally, Tau Poco's chef, Chris Dupont, owns Cafe Dupont just down the road and we already knew we liked that restaurant. So Tau Poco...here we come! First, the decor...eclectic and colorful! Painted by Veronique Vanblaere, who owns the Naked Art gallery, the look is bright and multicultural. On the restroom door, Vanblaere painted the different words for restroom from languages all over the world. 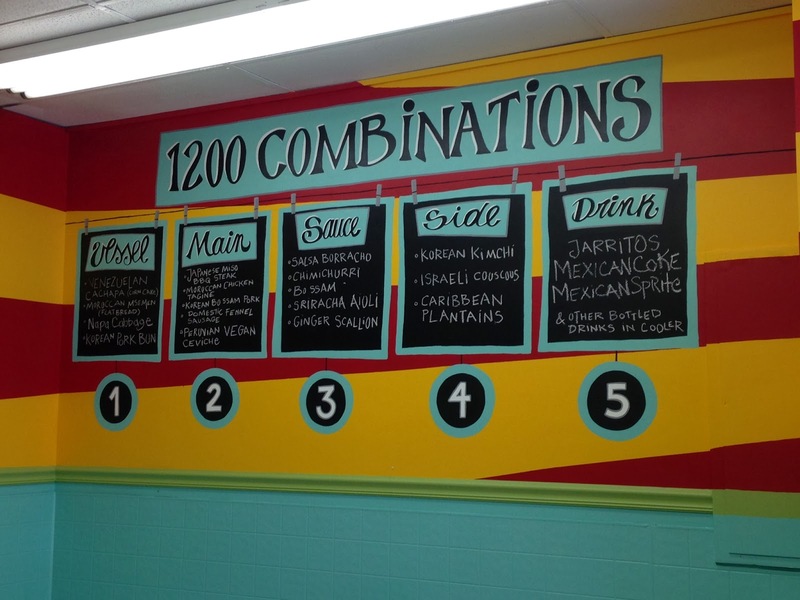 As the menu says...1200 possible combinations! As for the menu, we might not be sure how to pronounce all the words, but we googled the meaning of Tau Poco...Little Vessel. Appropriate for the concept, because the first thing you do in this eat by numbers establishment is Step 1..pick a vessel...sort of like the holder for the rest of your choices. 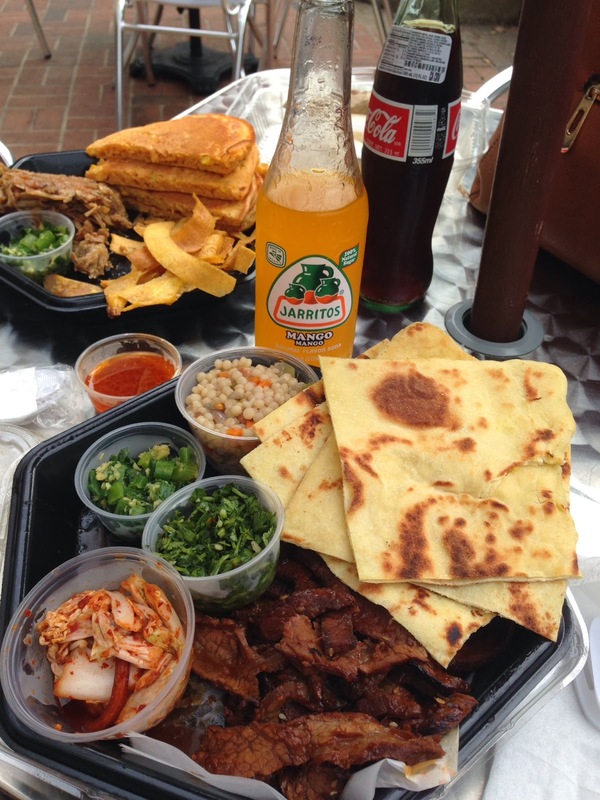 There are four to choose from: a Venezuelan corn cake, a Moroccan flatbread, a Korean pork bun and napa cabbage. Lu went with the flatbread and I opted for the corn cake. Step 2, we were on to our protein. The choices here were Japanese steak, Moroccan chicken, Korean pork, fennel sausage and Peruvian vegan ceviche. I chose the Korean bossam pork and Lu got the Japanese miso BBQ steak. Step 3, the next choice we had to make was for sauces to go on our meat. At the suggestion of our hostess, I ended up with bossam and ginger scallion. Luanne, true to form, went through her problems with sauces so that our hostess could see the limitations and challenges she would have when helping Lu choose a sauce. Those of you who have been with us for a while know the drill...Lu doesn't eat mayo, ketchup or mustard and nothing made with or similar to those ingredients. Armed with the required information, our hostess suggested the ginger scallion and chimichurri sauces. For Step 4, we had to choose a side. My choice was the Caribbean plantains and Luanne, who wanted the plantains but, (ever the professional and in the interest of our readers), chose something different... the Korean kimchee and the Israeli couscous. Finally, Step 5, we were onto drinks...Mexican Coke or Sprite, Jarritos (a variety of fruit sodas) and water. Lu loves fruity drinks, so she got a mango Jarritos. I got a Mexican Coke. What is a Mexican Coke, you ask? It is a Coca Cola, but unlike the American version, it is made with cane sugar instead of corn syrup. Trust me on this...it makes a HUGE difference! Mexican Coke is much like the Coke I remember from my childhood in those little tiny glass bottles...so much better. Since Sherri could not eat with us, we asked her what she would have chosen. She said she would have gotten the Korean pork bun, the Japanese beef, the bossam and ginger scallion sauces, the plantains and the mango Jarritos to drink. We cannot get Parker to embrace the concept of choosing something different in the interest of our readers...even if she is not actually eating the food! So, what was the verdict? We loved our multicultural lunch. 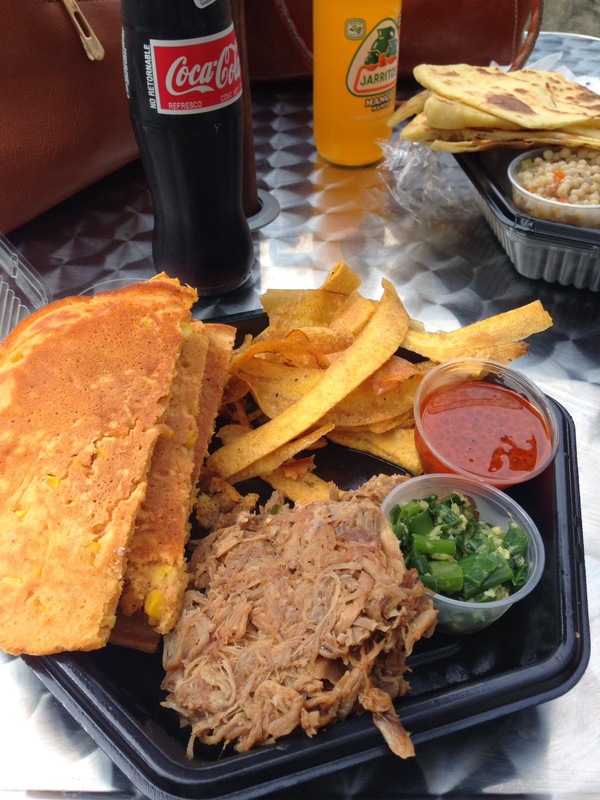 Our favorites were Luanne's beef brisket, my corn cakes, the plantains and the smoky, bacony Israeli couscous. 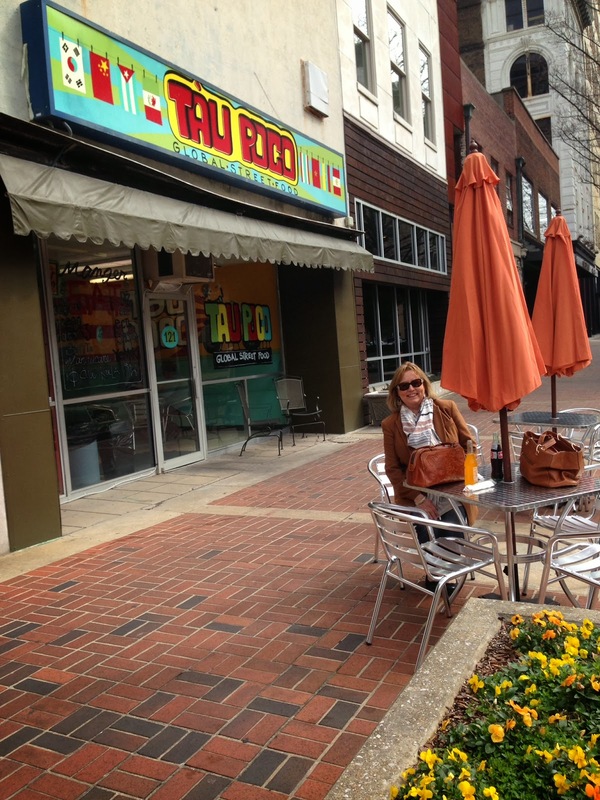 I am not a big kimchee fan, but Lu loved it. The yummy sauces added an extra dimension that should not be missed. Tau Poco is definitely not the place for those timid eaters who refuse to try anything new, but if you like to venture out and sample cuisines from around the world, there is no better place than Tau Poco. Go pick your own little vessel and fill it up! What a great post! We'd love to feature you for Foodie Friday on AlabamaWomenBloggers.com this week. Can we use one of your images and link to you? Let us know! alwb(at)thefoodiearmywife.com Thanks!